As a child, I had seen the old Hindi film ‘Kunwara Baap’ which continues to stay in my mind, even today. It had Mahmood the famed comedian as the lead actor; but the tragedy of the story itself leaves everyone teary-eyed by the end. It was the story of a polio-affected child being raised by an unmarried man. The crippling disease called polio, the terrible pain of the parents, and the grave need to combat this disease was very effectively brought out by this landmark film. Through a very gripping, tragic, tale of love, betrayal and reconciliation, this timely movie of 1974 educated the masses on the deadliness of this disease, and the need to get vaccinations. I remember my father explaining about polio when I asked him why that little kid in my school needed those steel crutches to walk. 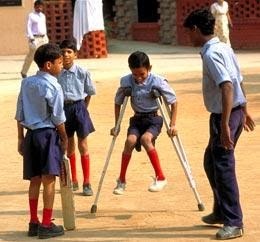 I remember, seeing in my school playground, at least 4 students ambling on those crutches affected by this disease, yet laughing and playing with us - Falling, getting up and continuing to play. Poliomyelitis, which is the right name for ‘polio’ or infantile paralysis, is an acute, viral, infectious disease spread from person to person; and today, only a concerted effort by several governments around the world is ensuring its slow but gradual reduction. Needless to say I was very happy and excited to read the news that “India became polio-free last month on January 13th, three years after its last victim, four-year-old Rukhsar Khatun, was diagnosed with the disease in West Bengal”. “A labour-intensive and coordinated campaign led by the Indian government, Rotary, the Bill and Melinda Gates Foundation and the Global Polio Eradication Initiative deployed two million staff to vaccinate 170 million children throughout the country on two dates to help finally wipe out the disease. “It involved sophisticated monitoring, accurate data-collection, and strict management by local officials in one of the most effective government-led initiatives in India’s history”. Just three decades ago,more than 150,000 polio cases were diagnosed in one year alone. But, today, to hear that the disease is no more in India, is indeed a morale booster for Indians. During my high school years I read that Jonas Salk was the inventor of the vaccine made to fight Poliomyelitis. And I knew then itself, that I will never forget his name. With effective vaccination researched, developed and administered, USA had become completely Polio-free by 1979 (CDC news here). It took longer for India. After-all, when you consider a billion-plus people, it is an amazing achievement, even if it is done now. I just hope there wont be another case surfacing anywhere, bring us down again. Indians must thank God, Jonas Salk, The Global Polio Eradication Initiative, Indian Government, Rotary, and Bill and Melinda Gates Foundation for this great achievement. I think, in that order.